Nigeria: Muslim Fulani herdsmen, accompanied by known “Islamic extremist militants,” says a report, raided a Christian village and massacred 20 Christians, including a 3-month-old baby and eight other children, as they slept sometime after midnight, Friday September 8. Police, who reportedly treated the incident with some indifference, said it was a “reprisal” attack for the discovery of a decapitated Muslim boy; but dumbfounded Christians argued that the murder happened in another village over a year ago and they had nothing to do with it. Separately, Cyriacus Onunkwo, a Catholic priest, was abducted by Islamic gunmen on Friday, September 1 and found slaughtered in the bushes on the following day. Nothing was stolen from his car and no ransom was demanded for his release. Pakistan: On September 13, a Christian boy (exact age not provided) was misled to an isolated area, beaten, “gang raped,” and ordered to recite the Islamic profession of faith by seven Muslim men. According to the report, “initially they started beating him violently and stripped off his clothes. They sexually assaulted Sher Dil [the youth] and forced him to recite Kalma. Sher Dil was again beaten and fell unconscious, and was taken to a local hospital by the alleged rapists. They warned him of dire consequences if he would disclose the details of the incident to anyone.” Police were “reluctant” to respond and, when pressed to act by the victim’s father, “took sides” with the rapists, notes the report. Last mentioned, the boy is under threat of death from his tormenters for going to the police, even as his father implored the Ministry of Human Rights for aid. A group of kidnappers meets in a mosque to discuss potential victims. They keep a close eye on Christians’ houses and monitor everything that’s going on. On that basis, they weave a spider’s web around [the girls]…. I remember a Coptic Christian girl from a rich, well-known family in Minya. She was kidnapped by five Muslim men. They held her in a house, stripped her and filmed her naked. In the video, one of them also undressed. They threatened to make the video public if the girl wouldn’t marry him…. The kidnappers receive large amounts of money. Police can help them in different ways, and when they do, they might also receive a part of the financial reward the kidnappers are paid by the Islamisation organisations. In some cases, police provide the kidnappers with drugs they seize. The drugs are then given to the girls to weaken their resistance as they put them under pressure. I even know of cases in which police offered helped to beat up the girls to make them recite the Islamic creed. And the value of the reward increases whenever the girl has a position. For example, when she is the daughter of a priest or comes from a well-known family…. The Salafist group I knew rented apartments in different areas of Egypt to hide kidnapped Coptic. There, they put them under pressure and threaten them to convert to Islam. And once they reach the legal age, a specially arranged Islamic representative comes in to make the conversion official, issue a certificate and accordingly they change their ID…. If all goes to plan, the girls are also forced into marriage with a strict Muslim. Their husbands don’t love them, they just marry her to make her a Muslim. She will be hit and humiliated. And if she tries to escape, or convert back to her original religion, she will be killed. Iran: Iranian national media reported that several Christians, almost all of whom are converts, in Tehran, Rey, and Pardis, were arrested after a video surfaced showing dozens of Bibles and other Christian literature, which were also confiscated by authorities. Little other information is provided. 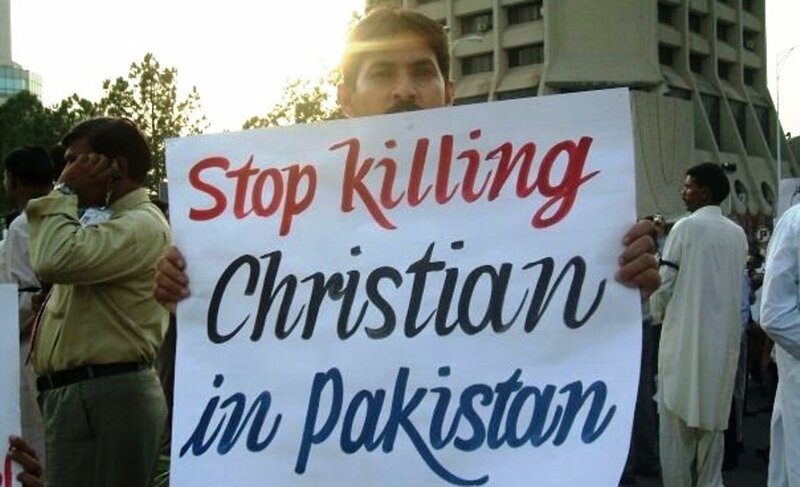 Pakistan: On September 14, a court sentenced a Christian man to death for “blasphemy” against the prophet of Islam. Nadeem James, a 27-year-old father of two, was originally arrested in July 2016, after a Muslim angry with him for personal reasons falsely accused (the illiterate) James of texting a poem deemed “blasphemous” of Muhammad. The condemned’s brother explained what next transpired: “We were not at home when the police raided our house to arrest Nadeem. However, when the cops couldn’t find any of us in the premises, they took away two women of the family – my wife and the wife of my elder brother, Faryad.” Around the same time, local mosques began calling on megaphones that if he did not surrender himself, Christian homes would burn. Nadeem surrendered himself and the women were released. “The charge against my brother is completely baseless,” the brother maintains. “Nadeem is uneducated and could not have possibly sent that text message. I’m certain that Yasir Bashir [Muslim accuser] downloaded the supposedly blasphemous text onto Nadeem’s phone and then forwarded it to his cell number to build a case against my brother.” Nadeem’s lawyer said they will challenge the conviction in a high court. Turkey: Photos taken clandestinely of the largest Armenian cathedral in the Middle East “reveal considerable damage to the sanctuary and walls of the now desecrated church in southeast Turkey,” notes a report. Its crucifix was “defaced,” its windows smashed, and its pews used as firewood; garbage was dumped in its sanctuary. First built in the 1600s, Surp Giragos Armenian Apostolic Church is one of six Christian churches in the Sur district to be confiscated by the state. For three years now, Christians—Armenian, Assyrian, Chaldean, and Protestant—have been unable to worship in their churches as authorities placed all Christian property in Diyarbakir on the Turkish cabinet’s expropriation plan. “We have been exposed to ethnic and religious discrimination for years,” said a local pastor. Malaysia: Police managed to foil an Islamic State terror plot targeting Christian churches and other non-Muslim places of worship after they arrested a 21-year-old Muslim affiliated with the jihadi group. According to the General of Police, the Muslim youth had “received instructions from a Malaysian Daesh (or IS) member in Syria to buy a pistol, a M-16 rifle, an AK-47 rifle and hand grenades from a neighbouring country with the aim of launching attacks on non-Muslims and their places of worship.” Chemicals used to assemble the devices were discovered in his house. Although Malaysia is Muslim majority, sizeable populations of Christians, Buddhists, and Hindus also live there.